The Dau Church History Library is collecting material on each past and present church in the City of Detroit: its written history, anniversary or celebration booklets, photos of the interior and exterior of the church facilities, videos where possible, information of clergy or the parish, verbal histories, and any small historical artifacts. We do not have the resources to do genealogy research. The Library is limited mainly to past and present parishes of the City of Detroit only for the sake of drawing some type of geographical boundary to the historic collection. An Annual Church History Seminar is held at Historic Trinity presenting lectures and information pertaining to some phase of church history. The Dau Church History Library does not contain the genealogical collection of church records listing births, weddings, and deaths. We will provide the proper referral source where possible. However, some day it is anticipated the library will develop CDs on individual parish histories. The Library is named after a son of the congregation, the Rev. Dr. W.H.T. Dau. Dr. Dau was a professor at Concordia Seminary in St. Louis, Missouri and an Assistant Pastor at Old Trinity Lutheran Church in St. Louis, Missouri. He was a major contributing translator and editor of the”Concordia Triglotta” – the Symbolical Books of the Evangelical Lutheran Church in German, Latin, and English. Dr. Dau in 1925 became the first Lutheran President of Valparaiso University in Valparaiso, Indiana. Dr. Gilbert T. Otte, the sixth Pastor of Historic Trinity Lutheran Church from 1927-1981, began the Dau Church History Library from a scattered collection of books and booklets on Lutheran history in Michigan. In 1982, with the help of a grant from the McGregor and Gannett Foundations, the library was rebuilt and equipped. The Rev. Dr. David Eberhard developed the concept of formally collecting the history on all past and present churches in the City of Detroit. The Library is funded by Historic Trinity, Inc. and tax deductible contributions from corporations and individuals. The Dau Church History Library works in close cooperation with the Burton Historical Library of Detroit the Bentley Historical Library of the University of Michigan, and the Concordia Historical Institute in St. Louis, Missouri. 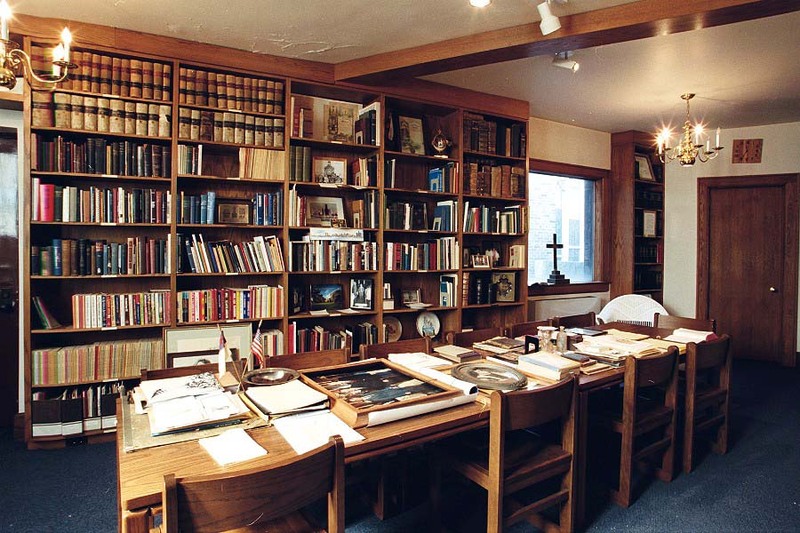 Besides cash donations, the Dau Library is in need of additional equipment, volunteers to catalogue and prepare materials, church anniversary booklets or church historical materials, artifacts from churches, photos of events or groups at churches, Bibles of all translations, and photo and video equipment. For information call (313) 567-3100 or Fax (313) 567-3209 or email Historic Trinity at church@historictrinity.org.